Max Nacheman saw a red dot in the distance as he approached mile 35 of the JFK 50 Mile. The D.C.-based first-time ultra runner was trudging along a lonely stretch of the course between aid stations and was tired. His knees hurt. Struggling to hit 10-minute miles, he could see his goal time slipping away. As Nacheman closed in on the red dot on the horizon, he began to hear music. Moments later, the red dot materialized into Disney superhero Mr. Incredible, jumping up and down to music coming from speakers strapped to a bike. No, Nacheman wasn’t hallucinating (though it’s a fair question to ask, during an ultra). There was, in fact, a man dressed up in a costume cheering on runners and dancing to music. At that moment, the motivational song was “Be My Lover” by La Bouche. Anyone who has completed a major race in the D.C. area in the last five years (the Marine Corps Marathon, the Rock ‘n’ Roll USA Marathon, JFK 50 Mile, Cherry Blossom) probably has something in common with Nacheman: both have been motivated by the electric jolt that comes from seeing Mr. Incredible among the spectators, dancing to music, dishing out his high fives. But who is the mystery man who started showing up at races in costume around D.C. five years ago? Who hasn’t missed a JFK 50 Mile since? Who has taken the job of cheerleader and elevated it to superhero status? His real name is Paul Silberman, DDS. That’s right — Mr. Incredible is a dentist Monday through Friday at his practice, the Silberman Dental Group in Waldorf, Md. While Silberman himself isn’t a runner, his friends are. In fact, that’s how his journey to becoming Mr. Incredible began. When race day arrived, Silberman parked at the finish line, then strapped the speakers onto his bike with duct tape. Silberman eventually upgraded his sound system to two large speakers, which require large and expensive batteries and puts the weight of the bike at more than 100 pounds. Six years after his first JFK 50 Mile, he came up with the idea of putting on the costume. His friends noticed the transformation, too. Harr, who also benefited from Mr. Incredible’s energy jolt at one JFK 50 Mile, said prior to race day, Marine Corps officials brief law enforcement partners on the entire entertainment plan, including Mr. Incredible’s case. Silberman preps for races in the same way a runner would. He hydrates the night before, anticipating that he won’t have many opportunities to stay hydrated during the race. He spends hours perfecting his race-day playlist. He arrives early. He makes one last trip to the bathroom before putting on his costume. And just because he gets on his bike when runners’ shoes hit the pavement, doesn’t mean he’s not burning any calories. During this year’s JFK 50 Mile, he rode nearly 60 miles. That’s while lugging more than 100 pounds. The temperature at the finish line that day was a miserable 16 degrees — not quite ideal biking temperatures. During Marine Corps, Silberman starts his day at 6:30. He rides the course until he reaches mile eight and stays there to give out high-fives and cheer on runners until 10 a.m., when most of the runners have gone past this point. Then he rides down the course to the 14th Street Bridge at mile 20 where he sets up to give runners one last boost to the finish. Getting from one place to another isn’t always smooth. It’s a good thing they did. 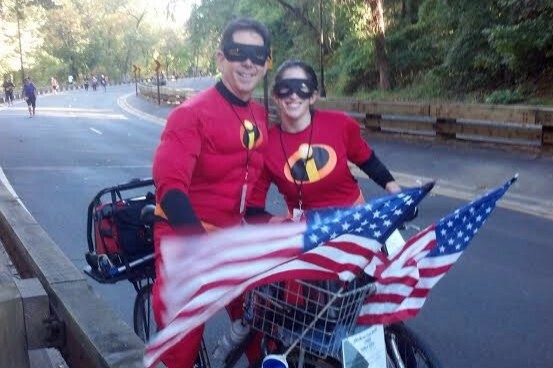 While cheering during the 2014 Marine Corps Marathon near mile 25, Silberman came across a wheelchair-bound disabled veteran who couldn’t move his arms anymore. Silberman contacted the race coordinator the day after the race to confirm the vet received his medal, which he did. “It doesn’t matter, I’m stuck and I can’t move,” the veteran told Silberman. Mr. Incredible most recently picked up a sidekick: his daughter, Lauren, who lives in D.C. Lauren ran cross country and track in high school and college and has started to join her father in costume at races as “Violet.” She said that her father understands running culture even better than some runners. Silberman typically never crosses the finish line himself in races, except for in the JFK 50 Mile. But even then, he doesn’t receive a medal or any of the other race memorabilia participants get to take home with them after a job well done. Yet he keeps showing up to the next race year after year. After a long day of dancing, biking and running back and forth cheering on runners, the man in the costume will unload all of his equipment, mount his bike on the back of his car and head back home. He’ll hang up his costume and mask until the next race. When Monday morning rolls around, the avid cyclist will walk into his dental practice and start seeing patients.